When Department of the Interior (DOI) Secretary Ryan Zinke – whom I admire greatly – let a last-minute Obama endangered species designation for the “Rusty Patched Bumblebee” (RPB) take effect in March 2017, I faulted the decision (here and here). Now I want to praise his recent decision to reopen certain wildlife refuges to modern farming practices. The RPB decision did the unthinkable. It gave Interior’s often hyper-activist U.S. Fish and Wildlife Service (FWS) potential veto power over every farm operation, building project and land use decision across 378 million Eastern and Midwestern acres, the RPB’s (possible) erstwhile habitat. That’s equal to Montana, North and South Dakota, Minnesota, Wisconsin, Iowa, Illinois and Indiana combined! All to “protect” a ground-nesting bee that provides minimal pollinating services, has supposedly been "sighted” a number of times since 2000 in 13 states, has long been rare for multiple reasons, and got its “endangered” status due to an collusive sue-and-settle lawsuit between agitators and regulators. This is the same FWS that told a timber company it had to create “potential” habitat on its land in Louisiana for a “dusky gopher frog” that has not been seen in the state for 33 years and could not survive on the 1,544 acres of company land selected by the FWS, because the chosen area did not offer essential habitat conditions. So Fish and Wildlife ordered the company to convert the land into “suitable” habitat, at company expense – after which the company could never cut trees in the area! The RPB decision was particularly perilous for farmers because, just a few years earlier, the Service had eagerly negotiated yet another sue-and-settle style agreement with radical greens in the Center for Food Safety, to ban genetically engineered crops (aka GMOs) and neonicotinoid insecticides on the extensive lands the FWS leases to farmers in often enormous U.S. wildlife refuges. The ban was issued without any public consultation or comment period. Worse, it was wholly at odds with USDA and EPA findings on the environmental safety of both GMOs and neonics. But it was a huge gift to activists who have been campaigning against those technologies for years. It set a dangerous precedent of basing government decisions on “precautionary” criteria, much like Europe’s wholly unscientific regulatory process, which is completely antithetical to the risk-based U.S. system. The infinitely malleable “precautionary” pseudo-guideline says chemicals and other technologies should be restricted or banned if there is any possibility (or accusation by radical activists) that they could be harmful, even if no evidence-based cause-effect link can be shown. Even worse, the “Precautionary Principle” only examines (often inflated) risks from using technologies that activists or regulators dislike. It never considers the risks of not using them – or risks that using them could reduce or eliminate. Just as perversely, anti-technology factions ignore or actively suppress evidence of harmful impacts from supposed alternatives – and from any technologies they support. The European Union has formalized the Precautionary Principle as official policy. Regulators thus have carte blanche authority to take any action, at any time, no matter how arbitrary, based on the claim that sometime in the future, in ways not yet understood, something might possibly have a negative impact on people or the environment. Scientific evidence is not needed. It’s an open door to regulation by activists who are experts at raising alarms and making claims of impending Armageddon unless a targeted technology is banned. Europe’s embrace of “precaution” in agricultural regulation is a major reason why the continent has become a net importer of food, despite having some of the most fertile land and predictably temperate weather in the world. If this horrendous refuge precedent had stood, combined with the Endangered Species Act, it could have given a few USFWS activist regulators the power to micro-manage enormous swaths of the American landmass, and large segments of the nation’s agricultural and construction economy. Its impacts would have been felt almost as widely as the infamous “Waters of the United States” (WOTUS) rule that presidential candidate Donald Trump vowed to kill and which the EPA under Scott Pruitt began to dismantle – or the even more insidious Paris climate treaty, which would have given international and United Nations climate alarmists control over the entire U.S. economy. I’m therefore happy to note that Mr. Zinke Department has implemented a double reversal of the USFW double ban. In an August 2 memo, Interior again spelled out the need to raise crops in parts of wildlife refuges to provide food for people and forage for ducks and other water fowl – and to note the important role that genetically engineered plants and neonics play in that effort. Of course, the GMO-neonic ban never made an iota of scientific sense. Hundreds of government and independent studies – and decades of eating and other real-world experience – confirm that GMOs are as safe for human and animal consumption as the almost 100% of crops that have been genetically modified by traditional breeding … or by soaking seeds in harsh chemicals or bombarding them with radiation to cause multiple mutations, some desirable, others unknown, but just fine with organic food promoters. Equally important, the massively funded environmentalist campaign against neonics was based heavily on the wholly fabricated “bee-pocalypse” scare of several years ago. As most people now know, honeybee populations have been rising the entire time since neonics were first used, and the problems honeybees had for several years were due to Varroa destructor mites and an assortment of bee diseases. Anti-neonic agitation also ran headlong into EPA’s scientific risk assessments. Even amid the regulatory frenzy of the final Obama years, EPA could find no scientific reason to take away the long-standing approvals of these vital crop production tools. Not surprisingly, though, once the honeybee-pocalypse was debunked, activists immediately switched gears to the equally fraudulent claim that wild bees are on the path to extinction – because of neonics, of course. However, wild bee problems are also almost entirely due to disease and long-term habitat loss. The vast majority of wild bee species are “doing just fine,” prominent U.S. Geological Survey wild bee expert Sam Droege has noted. Even more telling, a recent global study of wild bees found that those which pollinate crops and thus come into most frequent contact with neonics are flourishing. Greens have already announced they will sue to block the refuge decision, but that’s par for the course. Secretary Zinke deserves high praise for starting to rein in USFWS’s regulatory power grab. However, it’s only a start. There’s much more left to do: at Interior, Agriculture, Energy and of course EPA. Next up should be the Fish and Wildlife Service’s role in implementing the Endangered Species Act. Even if congressional attempts to rein in some of the worst abuses of the ESA finally succeed, after years of futility resulting from environmentalist intransigence, agency activists will find ways around them. Mr. Zinke also deserves major kudos for pushing back on the nonsensical claim that 129 million dead trees in California, repeated conflagrations that completely wipe out wildlife habitats and species, over 700,000 once-Golden State acres burned so far this summer (Rhode Island plus Washington, DC), and 57 Californians killed by forest fires in two years – are due to that all-purpose villain: climate change. As the Secretary makes clear, this horrific destruction is the result of near-criminal mismanagement of that state’s forests, at the behest of rabid greens who refuse to allow any timber harvesting anywhere. 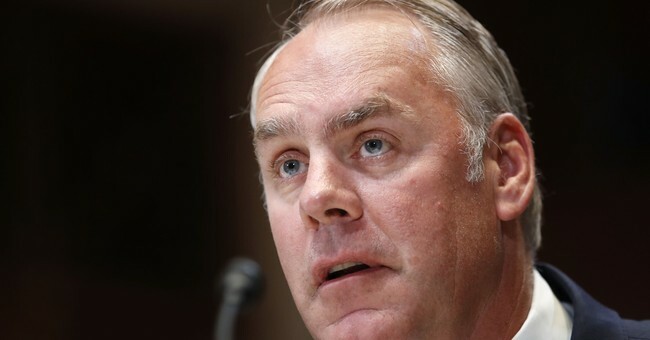 There’s an old saying that “personnel is policy.” Secretary Zinke next needs to replace DOI zealots with permanent, career service land and resource managers who can keep the eco-power-grabbers under control, by honestly, dispassionately and transparently applying evidence-based science to rulemaking.